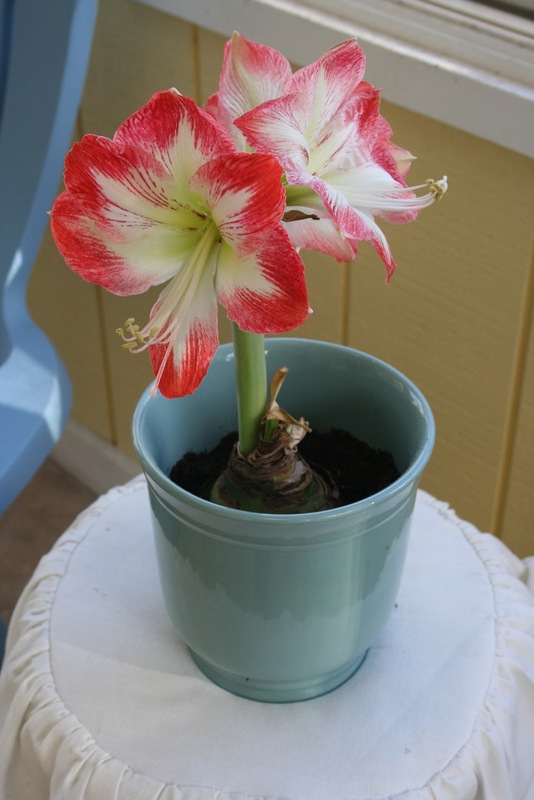 The Christmas Amaryllis put on quite the show this year. I'm always amazed at what beauty can come from a bulb. There is so much going on inside of that bulb that we don't see until just the right time. Flowers are such a metaphor for life in so many ways. As we are on the cusp of a new year, I wonder what is ready to burst forth. There will be good with bad, joy with sorrow, happy with sad. I'm so thankful that all of it rests in the hands of our all-knowing Savior who did not give us a spirit of fear. Let's go boldly into the new year with a thankful and trusting heart. Blessings! A beautiful reminder of what God can do with our hearts - hidden from all but on the outside for all to see. Blessings! Beautiful flower and even more powerful message. Thankful that God is in control. ...not a spirit of fear indeed! I love that verse! Happy NEW Year!!! Blessings to you!! That's just lovely - thanks. One of my favourite sayings is that "we know not what the future holds, but we know who holds the future in His hands". What a great post, Renee. Amen!